AUSTIN TROUT: "I'M TRYING TO MAKE A STATEMENT...I'M DEFINITELY NOT TRYING TO GO THE WHOLE DISTANCE"
"I have super confidence that I'm the best of the class and watching these guys with their opponents just kinda confirms all that, I believe....I'm trying to make a statement with David. I'm not taking anything away from David Lopez. He's been avoided for years for a good reason, and I see why. He's a tough, tall, strong guy. It's a tough fight, and it's going to be a good fight. I'm definitely not trying to go the whole distance in Mexico, but I'm prepared for it," stated jr. middleweight champion Austin Trout, who talked about his upcoming clash with David Lopez just days before the bout this Saturday. Check out what else he had to say! AP: Hey Austin. How is it going, man? AT: It's going good, man. AP: Good to hear. Being that it's so close to the fight, how do you feel going into Saturday? Are you nervous? Do you feel confident? How are you feeling? AT: I feel confident. I mean, probably Friday or Saturday, the day of the fight, I'll start feeling a little nervous, but that's normal. AP: Do you feel like you need to make a statement with this fight? AT: Yes. Most definitely. 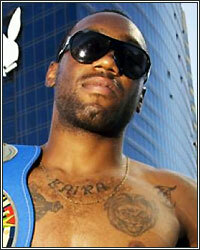 If I could beat him soundly, that would be a good statement for the boxing world. AP: You've had previous sparring experience with Sergio Martinez and Antonio Margarito. I was wondering, how does that help you get ready for somebody like David Lopez and his style? AT: Well, Sergio Martinez has a hard style to figure out, and I think I did good with him in the sparring. Mostly sparring with the type of guys like that built my confidence and showed me I am where I need to be as far as world champions go. AP: What do you think a win this Saturday night is going to do for your career? AT: I'm praying that it opens up more doors for exposure, and that maybe I can get an opportunity to maybe get a fight with somebody famous. AP: If everything goes according to plan and you get a big win this Saturday, what's going to be your next move? Or do you even know yet? AT: Well, I'm not looking past David because he's a dangerous guy. You know, maybe get a fight with Tony Mundine. It would be great. I've always wanted to go to Australia. I'm still eyeing Saul Alvarez, and of course I'm on the heels of Miguel Cotto, so I think a win now would put a little bit more pressure on those guys to get in the ring with me. AP: That's funny you said that because you've called out Cotto, Alvarez, and Chavez Jr. in the past, so I was wondering if you have given up on those fights or is that something you still want to have happen? AT: Yeah, I still definitely want to have those fights. They're still the fights I want to get and I'm just hoping that, you know, if I beat up David real good, they won't be able to say no anymore. I'm not giving up on the fights; I'm just being realistic and not waiting for those fights. AP: Did you get to see the Chavez fight from Saturday by any chance? AT: Yes, and let me tell you, I was not impressed at all, and watching that fight kind of makes me think he's not going to take my fight anytime soon. That would be the smart thing on his part, but like I said, I'm on their heels and they can't run forever. AP: (Laughing) That sums it up I guess. If you don't get those fights at 154, would you consider going down to 147 or going up to 160? Or maybe try to get somebody to meet you at 154? AT: I feel comfortable and strong at 154. I'm not putting anything past me, but like, if there was a multi-million dollar fight, I'd try to get to 147 if I have to. As far as going to 160, that I can go to more realistically than 147. I have not seen 148 since I was 14 years old. AP: Another guy who had a fight on Saturday and is in your weight division is Vanes Matirosyan. What did you think about his fight? Did you get to see it? AT: Yeah. He got floored and came back with a knockout, which kinda proves two things. One, he's chinny, and two, he's got a lot of heart, but these are things I already know. Again, he just motivates me to get in with these guys. I have super confidence that I'm the best of the class and watching these guys with their opponents just kinda confirms all that, I believe. AP: Another guy that was in your class that you just don't hear anything about is Alfredo Angulo. Do you have any thoughts on him? AT: Alfredo, you know, I always thought he was overrated. You know, just a super tough guy. In my opinion, everybody in my class is good, so when I say that I'm better, I'm just...me personally, I think that I'm better. I'm not saying they're not good. You know, I just think that I'm better and Alfredo Angulo was one of the guys that was exposed by Kermit Cintron and you haven't heard anything about his fights since then pretty much. I would love to get in with Alfredo Angulo if the money's right, but right now, I guess he's kinda made himself fall off his own self. We'll have to wait and see if he can jump back on the radar. AP: It recently came out that Floyd Mayweather's going to be fighting Victor Ortiz in September. What do you think about that fight and what do you think about Ortiz in particular? I mean, in his last fight, he came in at 161. He may be a guy that one day, you know, may be up to your weight at some point. AT: Yeah, I know. I heard that and I was like, "wow!" What a good fight for Victor, to get the opportunity. Floyd picks his opponents well and I think Victor is probably a great style to compliment Floyd's style. You can't take anything away from Victor. He's a great warrior. He proved that with Berto. That's a nice jump to be up against Floyd. AP: Yeah, I think because of the fact that he is a southpaw and is also a quick guy, that's going to be an interesting match-up, but I just think Floyd's going to be too much for him. AT: I think Floyd is going to be able to box him down, but you know, I'm always for the bet. You know I like Victor and I hope he gets to hold the title for a lot longer than one defense. AP: Yeah, I'm sure he will be making a lot of money either way (laughing). AT: Yeah (laughing). I mean, you can't feel too bad for the guy. AP: Coming off of this past weekend, after seeing Carl Froch and Glen Johnson fight, who is your pick for the Super Six between Ward and Froch now? AT: Andre Ward! Definitely! He's smarter than everybody. I mean, whether you think he's boring or not, he's a man of God, for one, so he has God in his corner, Which I don't see anybody beating, you know, my God, which is the same God as his. And two, like I said, he is super smart, and the ability this guy has just exceeds everybody in his class. AP: I feel like Andre Ward is a champion's champion. AP: I mean, you couldn't ask for a better guy. I hope that his career continues to build. I think he is going to be too much for Froch myself, but has proved that he's a little better than maybe I want to give him credit for. AT: I give him credit. The guy's beating the best right now. He's beating them easily. He beat up Abraham, and he is the one who put Jermain Taylor into retirement. AP: He did. So is there anything you would like to say before your big fight? AT: Win, lose, or draw, I give the glory to God. I'm trying to make a statement with David. I'm not taking anything away from David Lopez. He's been avoided for years for a good reason, and I see why. He's a tough, tall, strong guy. It's a tough fight, and it's going to be a good fight. I'm definitely not trying to go the whole distance in Mexico, but I'm prepared for it. I would like to thank everyone for running with me, and make a winning fight.